Aida Salazar is a writer, arts advocate, and homeschooling mother whose writings explore issues of identity and social justice. She grew up in Southeast Los Angeles where she spent many days sitting in little puddles of water on cement believing she was in the ocean. Her forthcoming debut middle grade novels in verse, THE MOON WITHIN, and THE LAND OF THE CRANES, and her debut picture book, JOVITA WORE PANTS, will be published by Arthur A. Levine Books / Scholastic in Spring 2019, Spring 2020 and Fall 2020 respectively. Her story, By the Light of the Moon, was adapted into a ballet production by choreographer, Isabelle Sjahsam, and artist, Roberto Miguel, for the Sonoma Conservatory of Dance and premiered in April 2016. It is the first Xicana-themed ballet in history. With an MFA in Writing from the California Institute of the Arts, she has performed/read at cultural centers, cafes, alternative art spaces and universities throughout the Southwest and Latin America. She has taught visual art, poetry and fiction to students of all ages. Her writings have appeared in publications such as the Huffington Post, Huizache Magazine and Women and Performance: Journal of Feminist Theory. She was a resident writer at Hedgebrook Writer’s Colony, attended Community of Writer’s Workshop at Squaw Valley, is an alumni of the Op-Ed Project’s Write to Change the World Program and a member of the Society for Children’s Book Writers and Illustrators. 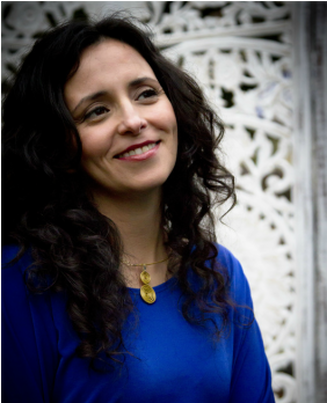 She is a founding member of Las Musas, the first debut / sophmore group of Latinx authors in US children's literature. She has also produced festivals, events, protests, artist residencies, and conferences for a range of groups, non-profits, youth and popular movements. She sits on the board of two non-profit organizations, CubaCaribe and BrasArte. She consulted in the planning and design of cultural spaces including LA's Grand Park and La Plaza de Cultura & Arte in Los Angeles. She currently lives in a teal house in Oakland, CA with her husband, Latin jazz musician, ​John Santos and home-schools one of her two fiery artist children. She is at work on a collection of essays on healing; many children’s stories; and a memoir, In the Womb of Love, about the death of her first-born infant child. Aida Salazar​ is a writer, arts advocate and home-schooling mother whose writings for adults and children explore issues of identity and social justice. She is the author of the forthcoming middle grade verse novels, THE MOON WITHIN (Feb.26, 2019), THE LAND OF THE CRANES (Spring, 2020), the forthcoming bio picture book JOVITA WORE PANTS: THE STORY OF A REVOLUTIONARY FIGHTER (Fall, 2020). All books published by Arthur A. Levine Books / Scholastic. Her story, BY THE LIGHT OF THE MOON, was adapted into a ballet production by the Sonoma Conservatory of Dance and is the first Xicana-themed ballet in history. She lives with her family of artists in a teal house in Oakland, CA.